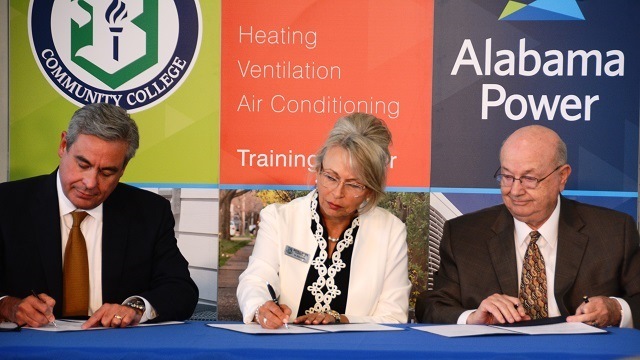 Bevill State Community College in Jasper and Alabama Power have joined forces to develop the HVAC Training Center on the college campus. While the current facility is in Clanton, Jasper will be home to a new, relocated HVAC training facility. There, the program will be expanded and course certification options will be included. New HVAC Training Center at Bevill State seen as an economic development investment from Alabama NewsCenter on Vimeo. Alabama Power Chairman, President and CEO Mark Crosswhite was joined by Alabama Community College System Chancellor Jimmy Baker, Bevill State Community College interim President Dr. Kim Ennis and Gov. Kay Ivey, along with state Sen. Greg Reed for a news conference. Leaders also signed a Memorandum of Understanding. Ivey noted the importance of public-private partnerships such as this. The center will ready students for the HVAC industry by teaching product application and installation, performance analysis and service. More than 33,000 people (from more than 40 states and four countries) have received training, professional development and education from Alabama Power’s HVAC Training Center since 1986.